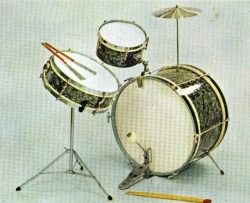 A magnificent drum which will respond to the very lightest touch. Highly polished chromium plated metal shell. Die-moulded counter hoops and eight tension fittings. Noiseless fast acting snare release with 20 strand wire snares. Tone control. A responsive wooden shell model with six tension fittings and strip steel counter hoops. Reliable snare release with 12 strand wire snare. Specification as model 325 but with laminated wood shell. 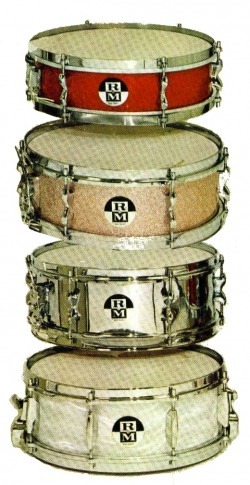 The finest snare drum available in this price range. Metal shell, rolled steel counter hoops, six tension fittings. Positive snare release, 12 strand wire snare. Similar specification to model 419 but with laminated wood shell; hard lacquer varnished inside for maximum resonance. Crystal, Ruby, Sapphire or Opal Flame. Blue or Red Storm Pearl. Marine or Grey Pearl. Champagne or Red Glitter. Black or White Mirror Plastic. Models as included with the 120 and 220 outfits and available in the same choice of finishes. Featuring latest pattern individual tension fittings, spurs and cymbal arm. Inlaid counter hoops. Models as included with the 320 and 420 outfits and available in the same choice of finishes. 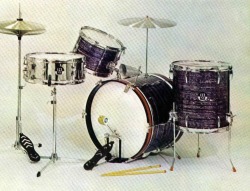 Fitted with six separate tension fittings and telescopic cymbal arm and spurs. Models as included with the 120 and 220 outfits and available in the same choice of finishes. Featuring Die-moulded counter hoops and latest pattern individual tension fittings. Models as included with the 320 and 420 outfits and available in the same choice of finishes. Fitted with robust rolled steel counter hoops and die moulded double tension fittings. The drums in this magnificent outfit feature the sleek new R-M tension fittings - a unique ball and socket type Tom-Tom holder plus cymbal arm, Bass Drum spur and Tom-Tom leg fittings of completely new design. 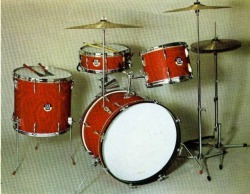 A compact, four drum set-up of the same overall high quality as the more expensive outfits but with smaller Tom-Toms and slightly less elaborate fittings. An inexpensive yet well-made outfit. Responsive separate tension Snare Drum and tension-able Tom-Tom both fitted with HEADMASTER plastic heads. Single tension Bass Drum with good quality vellum heads.